The parish church of St Mary the Virgin has stood on its present site since the mid 12th century and until 1848 served the whole town of Ilkeston. Since 1848 three new parishes were formed to serve the spiritual needs of the rapidly expanding town. The building contains many features of interest and architectural importance. Of the original 12th century building, only the three Norman pillars and arches still remain. 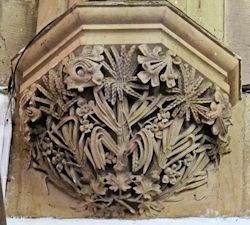 These form part of the south nave arcade. In or around the year 1200, a tower was erected at the west end and approximately fifty years later a north aisle was added to the nave. A few years after, an entirely new and enlarged chancel was founded by the then Lord of the Manor, Nicholas de Cantelupe, whose tomb can still be seen today beneath the east window of the church. In 1386 a chantry chapel dedicated to St Peter was erected on the north side of the chancel by Joan, the wife of a later Nicholas de Cantelupe. 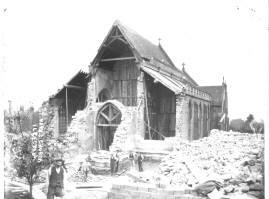 This chapel collapsed during the leaving the east end of St Mary’s open to the elements. The former site of the chapel was eventually used as an extension to the burial ground until its restoration in 1855. 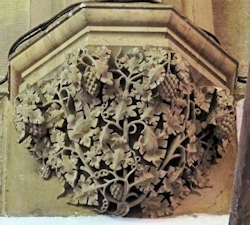 Other features of architectural and historical importance include the stone screen which, though much restored, does include some of its original stonework. The parish chest which dates from the 16th century, once stored the parish registers which themselves date from 1588. The Sedilia, which features the heads of King Henry the Third and his Queen, Eleanor of Provence, along with the Piscina, featuring the carved heads of a priest and a monk, are dated to the late 13th century. The organ was purchased from St John’s church in Paddington, London in 1866 and is believed to have been used by Mendelssohn. The organ has occupied its present position since 1990. The tower once featured a spire and, although no precise date can be found regarding its erection, was certainly in existence by the late 16th century, being featured on the earliest known map of the town dated 1598. The spire collapsed one stormy night in 1714 and was never replaced. 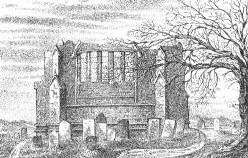 A new tower was erected in 1731 but just ten years later a new disaster struck when the roof of the chancel fell in. This exposed the insides of the church to yet more damage and by the early 19th century, St Mary’s was in a state of near complete collapse. 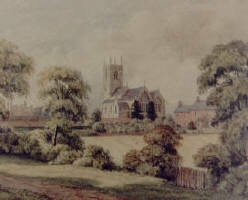 In 1855, Reverend George Searle Ebsworth (Vicar of Ilkeston 1842-1863) undertook a campaign to raise the necessary funds to have St Mary’s restored to some resemblance of its former glory. This restoration, though rescuing the church from inevitable destruction, necessitated the destruction of some of the oldest parts of the church. Parts of the east window had already fallen in while fragments of the ancient chapel of St Peter’s lay scattered around the church yard. The tomb of William de Cantelupe (died (c) 1308) was dismantled and removed from the church while the tomb of his father Nicholas, was moved from the centre of the chancel aisle to its present position beneath the east window. Though lost for over 150 years, fragments of William’s tomb were found during excavations in the grounds of the former vicarage of St Mary’s (see Ilkeston’s Archaeology). In 1910, the tower and the west end of the church was dismantled and an extension consisting of a further three bays was added to the church, thus almost doubling its capacity. This work was undertaken during the incumbency of Reverend Mollan Williams (Vicar of Ilkeston 1907-1915). Further restoration work took place in the 1960s during which much work was carried out on the exterior of the church. The replacement of stonework, pointing and the cleaning of the windows was later followed by a complete redecoration of the interior. Though incomplete, this list contains the names of those known to have served as church wardens during the years shown.